Visited here December 2013, January, February, and August 2014. Read about my Golden Rules of females travelling in Morocco. **Full disclosure: the majority of time I spent in Morocco was pre-blog, as information is widely available and the hostel/backpacking/tourist scene is very active, so I was not documenting any costs. Most info is from memory or re-researched after the fact. There are numerous companies travelling between southern Spain and northern Morocco; you may leave from Gibraltar (technically British territory, and apparently extremely patriotic! Think: red double-deckers and phone booths! ), Algeciras, or Tarifa, and may land in Ceuta, Tanger Med (port located 40 km from the city), or Tanger (or Tangier, or Tangiers) Ville. I opted to leave from Tarifa, because it was the only departure port to travel directly to the heart of the city. The port is located just outside the Medina, and it is walkable, but it’s also a mega hill, and a maze to navigate once you’re inside, so it’s easiest to grab a red cab, and have him call your hostel to meet you. I stayed at the Melting Pot in both Tarifa and Tangier; slightly higher prices than throughout the rest of Morocco, but I would say they’re the best in each of their respective cities. 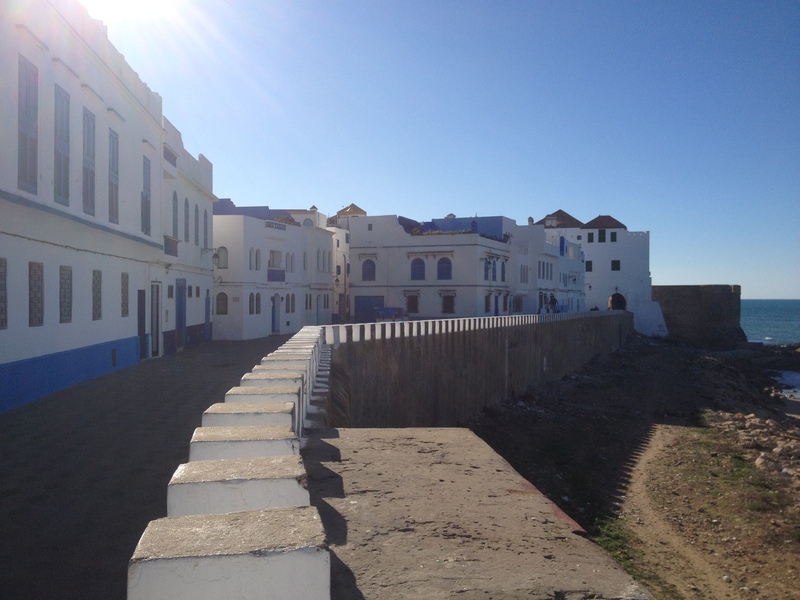 Asilah is a cute little town on the northern coast. It has a brightly painted Medina, thanks to a yearly festival where African artists create murals on the walls. Getting to Asilah is easy from Tanger, just a quick train ride away. Ticket prices and schedules can be found here. Take a cab from the station to get to the medina. When you get off the train, you may or may not meet a small, toothless man named Abdul. He is nice enough, but may not fully understand what you mean when you say that you want a cheap hotel (or he completely understands, but also wants to take advantage of your naiveté). If you are like me, brand new and easily manipulated, you might end up in someone’s house and get extremely overcharged for it. I don’t know anyone that goes to Chaouen (kind of like chow-in) and doesn’t love it. 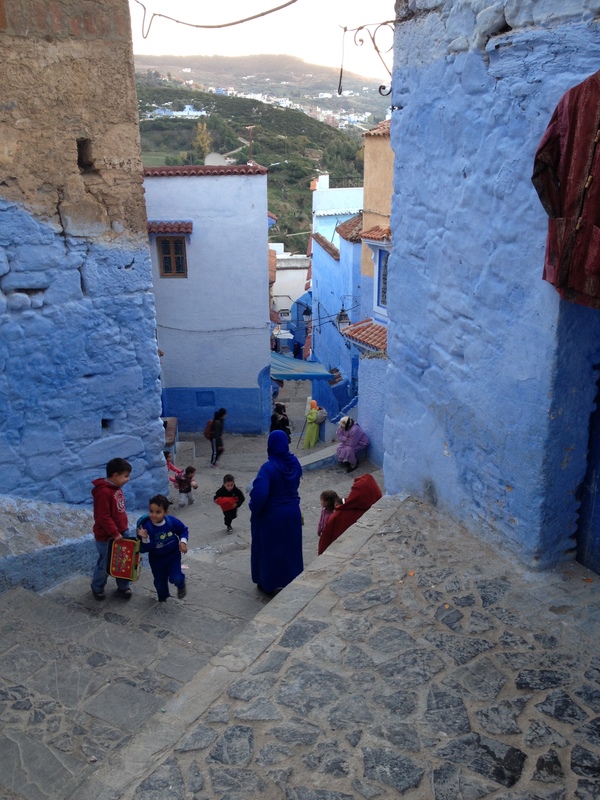 It’s stunning; this beautiful blue city perched up in the Rif mountains. It’s located in hash-central, so if that’s your scene, this is your place (and you might get stuck here). But even if it’s not, there’s hiking, swimming, and so much charm. But also, dang, can it be cold. So be prepared for that! I travelled for a bit with a group of guys and we ended up fighting tooth and nail with the driver of a Grande taxi to get a deal on it, which felt very silly to me, as I don’t think we were legitimately being overcharged in the first place. I think we ended up paying 30 or 35 dirhams for each seat from Tangier to Chaouen. Not bad when you can get cosy with the person you’re next to, but not my favourite form of transportation when you’re sardined in with random Moroccan men (or extremely… spacious women). We stayed at the Hostel Aline. Some other friends of ours stayed at the Pension Souika. At the time, Aline was similarly priced, but had hot water morning and evening, whereas I heard the hot water was just a myth at Souika. Aline didn’t have much of an atmosphere to it, but was clean, comfortable, and had a very nice view. When I visited, Souika was more like a hash den (not really my ideal kind of living). Your call! Let’s be clear; I was not a fan of Fez. But, I know that many people are. And perhaps I didn’t really give it a fair shot, but either way, I got in, and then I got out (and shed some tears in the midst of a birthday-gone-wrong). The CTM bus service throughout Morocco is fair and reasonably priced. Supratours is also great, but you pay for more for it. Certain routes, however, such as the one from Chaouen to Fez, makes you question your decisions. Or, the decisions of other people. Why, you ask yourself, do people take public buses when they are so acutely prone to motion sickness? I mean, I’m sitting there, not evening thinking about being sick, when people start losing their lunches, and then I’m suddenly considering it myself. Thankfully, I always held it together, but boy, did that take a lot of strength to look consistently the window and keep my headphones lodged securely in my ears. The peppermint oil also helped a lot! So, always be ready for that. The mountain routes in Morocco are extremely windy, and this can happen at any time. We stayed at the Funky Fes hostel, which in itself was pretty decent! Quite pretty, nice rooftops, good rooms, etc. But there was talk on the street about it running something like a Moroccan mafia… so, be careful? I think mostly just know that anything they offer to arrange (trips, hammam, etc.) will be overpriced, but that comes to be expected from any hostel. It did feel like a sketchy area to stay in, though. 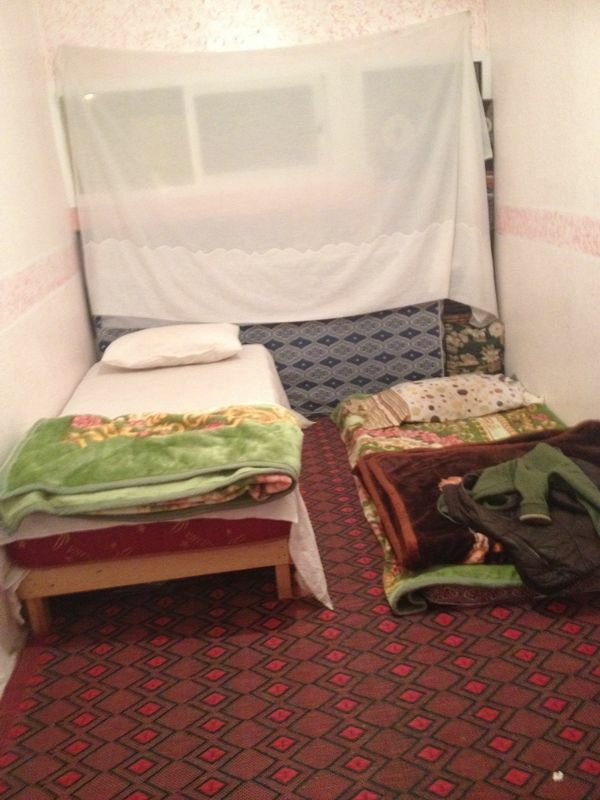 New hostels pop up all the time, check hostelworld and hostelbookers for more up to date locations and ratings! Oh, what to say about Marrakech. A crazy circus of a place; a giant spectacle of Arabian Nights. Hectic, loud, and in your face. But, kind of wonderful. It’s like after being lost for days, followed aggressively by local “guides”, in Tangier and Fez, you can all of a sudden breathe, watch, listen, and walk, at your own pace. You can be lost, but know that everything leads back to the heart of it, the place Jemaa el-Fnaa, so you don’t have to depend on anyone else. Plus, there are so many tourists that the locals ditch you as soon as you’ve passed them by. We took the train from Fez to Marrakech. Not bad! 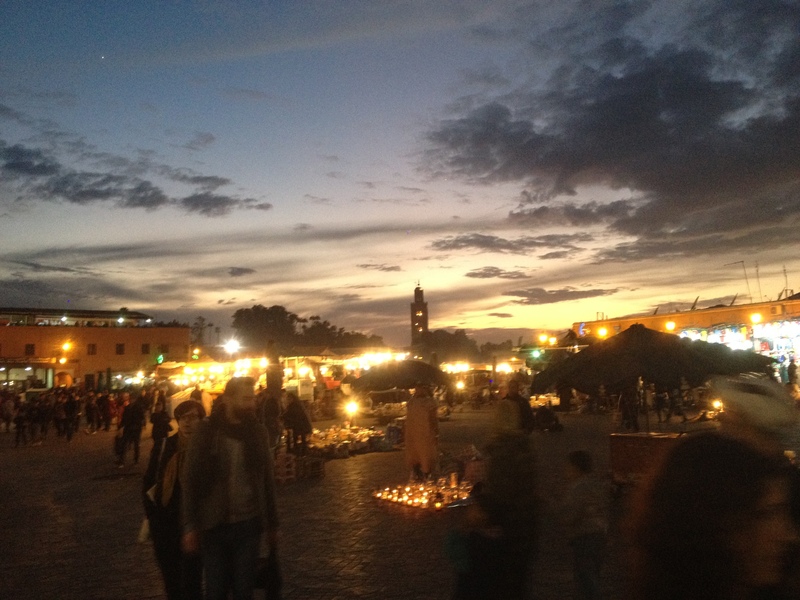 There are TONS of options for great hostels in Marrakech. They’re mostly all owned/managed by the same person, so they have mostly the same amenities and chill vibe to them. Waka Waka, Kif Kif, Rainbow, Marrakech Rouge, and more.. Most hostels run off of both hostelworld and hostelbookers. Occasionally, they get overbooked when their last bed gets booked at the same time on each of the sites, so try your best to be open-minded and flexible – they will do their best to help you out. The dunes are really amazing; you can arrange overnight camel treks (which I did not), or you can just walk up them yourself! It reminds you quickly just how out of shape you are, but it is really something when you stand up on top and watch the sun set. It’s a long trip, but Supratours is your best bet to get there quickly, directly, and comfortably. Get in touch with your accommodations beforehand and they will surely arrange to pick you up, or at least give you clear directions on getting to where you’re going. 130dh each way. I stayed at Dar Duna, which is a beautiful place, and can be really fun. But sometimes the management gets a bit carried away with the party, and neglects his responsibilities. As with everywhere in Morocco, be vary wary of advances by the guys! The desert is a strange place..
Oh, Essaouira. This is where my heart lies today. So beautiful, so charming. The perfect mix of real life and tourist-showcase. A wonderful winding medina, only big enough to be pleasantly lost, and then once again found. The usual culprits, CTM and Supratours, offer regular trips to Essaouira, but there are also local buses that are much cheaper, and surely, grande taxis. Ask at your hostel for directions to whichever route you take. Hands down, stay at Hostel Cloud Nine. It has moved since I was last there, but my lovely friend Jaouad has worked so hard at this, and is a wonderful host. I can’t wait to visit his new location, I am sure it will feel just like home. Even if you don’t surf, Taghazout is a cute beachside town, but with terrible food. I took the public bus (#32, I believe; just 7 or 9dh!) from Agadir. I had been coming from Merzouga at this point, which dropped me in Inezgane (in-za-gain; a suburb of Agadir, where the bus stations are), so I had to take a taxi to the city. At 4am, there was no option that wasn’t ridiculously expensive, but you just take what you get when you are alone at that hour of the morning. Once arrived in Taghazout, someone from the hostel came to meet me. 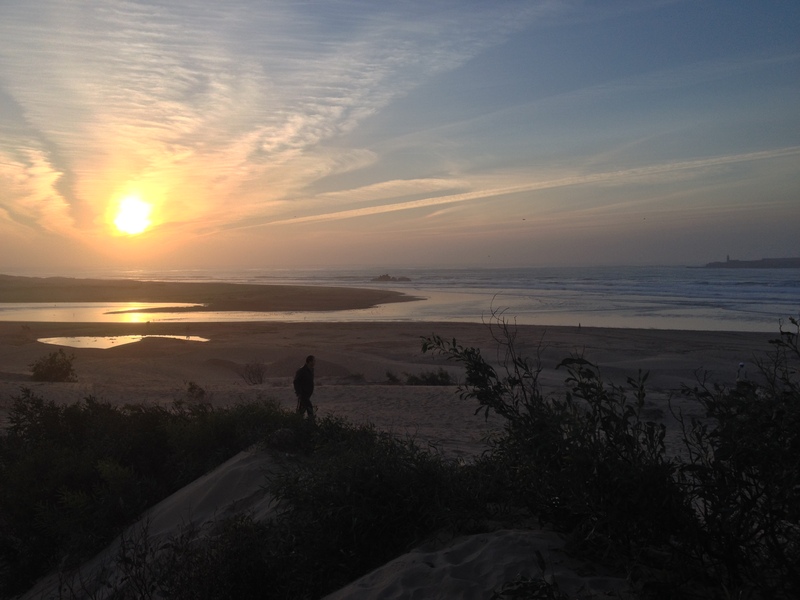 I stayed at Surfcamp Taghazout, which was perfect, welcoming, and clean (if a little sandy – damn surfers!) They offer tons of surf packages, and options for meals. Very chill place! There are even a couple of spots in town that offer yoga classes. Ommm! Here’s where we start getting off of the typical tourist circuit, and into the realm of the overlander travellers. Hostels are few and far between, and are rarely found in the bunkbed fashion we associate with dorm rooms (once you stay in a hostel where the beds are all singles, you start to appreciate the privacy bunkbeds somehow provide). I took the city bus back to Inezgane (the taxi from Agadir to Inezgane was significantly less during daylight), and then a grande taxi to Sidi Ifni (60dh). It is a very hilly place, so my “quick walk” shortly turned into a test of my own cardio endurance, but it’s certainly do-able. I stayed at the Hotel Suerte Loca in a double room, as they had no singles, for I believe 120dh. Luckily, I ran into another woman and she took the other bed and paid part of the bill! We also visited the Hammam, in my first hammam experience. As always, be careful about sketchy Moroccan advances.. This dusty Saharan town held little charm for me, but I came in late at night and left again the next morning. Getting to Tarfaya took longer than anticipated. Grande taxi from Sidi Ifni to Guelmim, and then a long wait at Guelmim for a CTM bus to Tarfaya. I had one of my most memorably unpleasant accommodations here, at some nameless place with nothing but a bed and dirty blankets (well, I guess it might have been considered to have two beds, depending on how you look at things). It took a long time in the morning for the taxi from Tarfaya to fill, but once it did, it wasn’t a very long trip. Just head out onto the main street and someone will ask where you’re going. I waited around the post office for my car to fill, chatting in a cafe and warding off marriage proposals. Laayoune itself is a pretty big city, a tad impersonal, and I didn’t notice too much that would drive a person there, except for a real shift in culture. I love the openness of the people in WS – the facades are dropped, and you are seen less as a means to financial gain, and more of an interesting person to talk to. Plus, it’s on the way to Dakhla, and that is worth the trip. There is a big UN presence here, so hotel prices are driven up, but I stayed at the Hotel Jodesa for no more than 100dh. It is clean and comfortable, but has zero charm. Located near to the CTM bus station. I checked out the Hotel Parador, as it’s also listed as a “Lonely Planet Recommended” hotel, but it was way out of my price range. The Hotel Sidi Ifni sounds like it could be an adventure (“very local in flavour”). Oh, Dakhla. So lovely. From stony desert plains, all of a sudden you are in some little mini desert mountains. And then up pops the ocean, as you make your way onto the peninsula of Dakhla, surrounded by brilliant blue ocean, peppered with kite surfers. The town itself isn’t terribly exciting, but has a nice friendly feeling to it. And also, the birthplace of meganonatrailer, in fact! I realized that there was such little information out there (especially in English) about this region, and had started spending so much time on my own at this point, that I needed an outlet. Shout out to my first post. I got here in a private car, as some friends I’d made elsewhere in Morocco lived in Laayoune, and we decided to do a road trip together. But I have no doubt that the CTM service here is perfectly fine. The Hotel Sahara (not the Hotel Sahara Regency, which is fancy and expensive) is a good place for travellers. It is in the vicinity of several other hotels (for example, Hotel Tira) in the same price range, so even if it’s full, you’re best advised to head that direction. 60/80/120dh for single/double/triple, respectively. With the two Hotel Saharas, you might be better off ask for directions to Tira, and go from there – they’re right across from each other. Also, CTM operates a service to the border, and I would be comfortable negotiating for a ride across no-man’s-land on my own now, but definitely appreciated the comfort of having a driver my first time across.